 Gould (There Goes Maine!, 1990; etc.) collects over 70 witty essays from his weekly columns for the Christian Science Monitor. From the first sentence of his first essay, he puts the taciturn, unflappable soul of Maine in clear focus: ``There is reason to believe that, if the sun came up with a derby hat on some morning, most of my neighbors would not look twice, and would hardly mention it to their wives when they came up from the barns to breakfast.'' 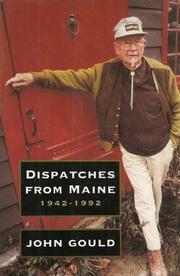 Gould retains this bemused, affectionate tone throughout the book, collecting and indulging the quirks and habits of Maine residents. His grandfather, for instance, always planted his flower garden among the vegetables. Why? ``He spent most the summer among his garden sass, and that was where he had to have his flowers if he were to enjoy them.'' Gould is also attuned to the rhythms of place, the larger ways in which people interact with their landscape, the symphony of drips in the sap buckets as March winds flail the tops of maples and ``the chatter of chickadees pecking at the suet you've brought along to nail up over the sugarhouse door. It's a great thing.'' There's a gentle comedy to the way Gould evokes moments of almost noble foolishness, like the time when the bottom dropped out of a pot and overbaked beans swam gamely on the floor in their own juice, leaving his wife ``holding the handle...helpless and forlorn.'' Better'n a steaming bowl of creamed codfish in January. Eyuh.